Whether you’ve never set foot on a dance floor before or you’re an accomplished dancer, this Silver Spring Ballroom has ample opportunities to develop and perfect your dancing skills. Hollywood Ballroom Dance Center offers a variety of lesson formats for all styles of ballroom dancing, for West Coast Swing, and for the Latin dances (Salsa, Bachata, and more.) Our spacious floor is also open regularly for practice sessions. See the listings below to find the perfect match for your learning style. Fun and easy. Flexible and affordable. Ballroom Dancing 101 is designed especially for brand-new-to-dancing customers and is unique to Hollywood Ballroom Dance Center. The program combines learning sessions with social dances. Multiple classes are offered each week and can be “mixed and matched.” Start just about any time; the program is ongoing. No partner required. No contracts, no commitments. The cost? Very affordable. Read more or register now. If you’d like an even more intense learning experience, you might be interested in taking private lessons–or combining both. Contact us about private lessons. Absolutely no pressure, no obligations. A very convenient way to learn new dance steps is to come to the complimentary group lesson an hour before most evening dances. These lessons may be divided by skill level, or instructors may adapt lessons to the skill levels of the attendees. Either way, our highly trained instructors will teach new figures to the group while still offering individual tips and advice. Then when the dance begins, you’ll be warmed up, with new techniques at the ready, and having gotten to know a few fellow dancers. The dances taught vary each evening. Both the main ballroom and the studio are used as needed. As always, no partner is necessary. See more detailed information about lessons before dances. To be sure you don’t miss the lessons that interest you the most, please frequently check the Calendar. Many of our instructors offer classes that meet one evening a week for three, four or more weeks. The classes usually concentrate on one type of dance per class. You’ll find classes from country and swing to traditional American and International style dances. Classes are available for all levels of dancers—beginners as well as intermediate and advanced dancers. These lessons are a very cost-effective way to learn new steps and new techniques. The cost can be as low as $5.00 an hour. No partner is necessary unless otherwise noted. For the most current selection of classes and for class prices, check our calendar. If you prefer more personalized instruction, you’ll improve much faster with individual lessons. Hollywood Ballroom Dance Center has some of the area’s most recognized and sought after instructors. Whether you’re looking for a partner for ProAm competition, want some coaching to improve your styling or you just want to learn how to dance, our instructors can help you to meet your goals. Let us know. We’ll match you with an instructor who will get you on your way. Take as many or as few lessons as you would like. We have no minimums, no contracts and no pressure. Give as a call, send us a note or contact an instructor. Practice sessions offer an opportunity to practice steps or routines on Hollywood Ballroom’s spacious floating floor. The title of the session describes the type of music that will be played. Instruction is not included. However, instructors hosting the practice session are often pleased to make suggestions when asked. All dancers are welcome and encouraged to come. However, if a session is an open practice session for International style, please be prepared to be dancing with very serious dancers. The rules of dance etiquette, especially not hindering the line of dance, are strictly followed in International style dances. American styles may be danced, but the tempo will be International. 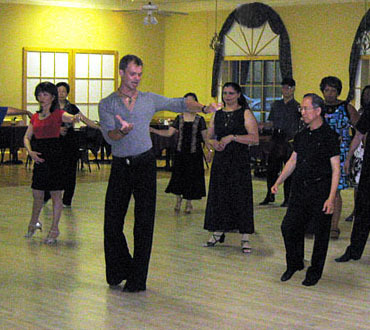 Usually the host instructor will repeat the same song several times in a row so that competitors have an opportunity to practice their routines. Requests for songs specific to a routine may be taken toward the end of the session. Find out more about Practice Sessions. For dates, details and prices of sessions, check the Calendar. Occasionally, our instructors or guest instructors offer specialty workshops. Have an idea or a special request? Please let us know. For events that have been scheduled, check the Calendar. Our instructors are encouraging and patient in their approach to helping students achieve their goals in dancing. The continuing classes our instructors teach can be found on our calendar. Their qualifications and contact information can be found on our page about Instructors. Listed below are some of the most popular dances we teach. The Hustle – Think Saturday Night Fever and Studio 54. Tango (American and Argentine) – Dramatic Latin moves consisting of sultry rhythms and staccato overtones. —–Tango is said to be the Dancer’s Dance. Specialty Dances, Line Dances and Fitness Dances, such as Jazzercise and Zumba, round out the dance experience.